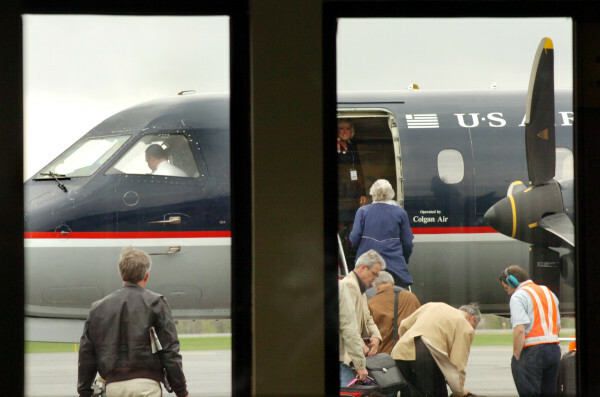 Passengers board a morning U.S. Airways flight bound to Boston at Northern Maine Regional Airport in Presque Isle on Monday, May 19, 2008. It appears that the efforts are starting to pay off, as the number of passengers is inching back up after hitting a low of 11,555 plane boardings for the year in 2013, according to airport director Scott Wardwell. The airport offers business and leisure air travelers non-stop service by PenAir, with 19 flights per week to and from Boston’s Logan Airport aboard PenAir’s Saab 340 aircraft, which seats 34 people. Last year the number of people who boarded planes at the airport went up to 12,122 and the total already is up for each month this year when compared to last year, except for March. In March, the numbers were down 19.25 percent as compared to the previous March, when “we had the Biathlon Junior World Cup Championship which resulted in a significant one-time increase in boardings,” Wardwell said. Otherwise, however, traffic was up 3.4 percent in January, 5.8 percent in February, 10.65 percent in April and 5.64 percent in May, he said. The airport began making subtle changes, such as in 2008 when students in a French-for-professionals class at the University of Maine at Presque Isle were asked to translate the airport’s website to make it more accessible to potential French Canadian customers. The airport also capitalized on the strength of the Canadian dollar in 2010 and offered a string of fare reductions to some of the most popular destinations for Aroostook County residents, such Las Vegas, Los Angeles and Denver. Wardwell said the bilingual website, discounted fares and other deals offered by PenAir continue to make an impact on traffic. “Our numbers are still going up,” he said this week. Even as the U.S. dollar has gotten stronger and it has become more expensive for Canadians to travel in the U.S., Canadian traffic has been holding steady, he said. While he doesn’t have a breakdown of passengers by nationality, Wardwell said he estimates that about 45 percent of the flyers using the airport annually are Canadian. He bases that figure on the number of Canadian vehicles using paid parking at the airport. Paid parking also is up for the year, he said. The passenger numbers are still a far cry from the airport’s heyday in the 1970s, when about 50,000 passengers boarded planes each year. But the closing of Loring Air Force Base in Limestone in 1994 took more than 10,000 military personnel out of the area, and helped to cause the decline of an estimated 15 percent of the region’s population over the next decade. The population decline as well as pricing differences between the local airport and much larger Bangor International Airport have had an impact on boardings, Wardwell said. The Sept. 11, 2001, terrorist attacks also affected boarding numbers at airports across the country, he said. Federal subsidies under the federal Department of Transportation’s Essential Air Service program also enable PenAir to continue operating in Presque Isle. The program was established in 1978 during the period of airline deregulation to provide federal assistance to air carriers serving smaller communities that otherwise might lose service because of economic factors. The combination of marketing and federal assistance helped make Northern Maine Regional Airport the fourth busiest airport in Maine in 2013, the latest statistics available, according to Homefacts.com, which tracks statistics about airports around the nation. The Presque Isle airport came in behind Portland International Jetport, Bangor International Airport and Knox County Regional Airport.